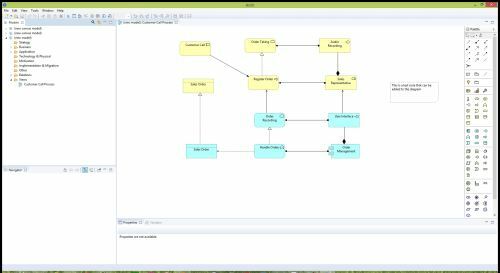 Archi is a free open source modeling tool to create business, IT and software architecture models using the ArchiMate modeling language. This language is an open and independent enterprise architecture standard that supports the description, analysis and visualization of architecture within and across business domains. ArchiMate is one of the open standards hosted by The Open Group and is fully aligned with TOGAF. Archi® is a registered trademark of Phillip Beauvoir and ArchiMate®, The Open Group® and TOGAF® are registered trademarks of The Open Group. The ArchiMate Enterprise Architecture modeling language is a technical standard from The Open Group. It is a visual language with a set of default iconography for describing, analyzing, and communicating many concerns of enterprise architectures in the business, application and technology main layers as they change over time. 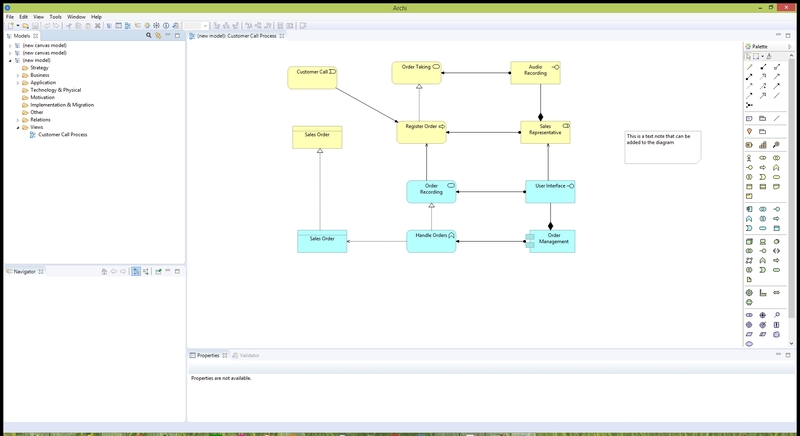 ArchiMate is different from other languages such as Unified Modeling Language (UML) and Business Process Modeling and Notation (BPMN) by its enterprise modeling scope. The goal of ArchiMate is to be "as small as possible", not to cover every edge scenario imaginable, but to be easy to learn and use. ArchiMate was intentionally restricted to the concepts needed for modeling the proverbial 80% of practical cases. It uses also colors to quickly understand the layers that are modeled, providing different viewpoints to the enterprise business, IT and software architectures. Installing Archi on a Windows computer is as simple as downloading the file and starting the install process. Some plugins are available on the website for instance to export data to Microsoft *.xlsx file format. I did not try to test them. The Archi tool has an extensive help system with an online guide, an optional contextual help window and some cheat sheets on how to create a new model or a map view. A 137 pages up-to-date PDF user guide is also available. The Open Group website proposes also various documents on the ArchiMate languages that can be downloaded for free after registration. I recommend to read some of them before starting using Archi. You can start working by creating a new model from scratch or you can base your work on a template model that you have previously created. The tool offers many features to help the user like contextual menus, mouse-over descriptions of symbols and a hint window to relate your current work to the ArchiMate definitions. You will also be prevented to create impossible relationships between diagram items. Archi is an easy to use and mostly intuitive diagramming tool. You create views that are the synonyms of diagram inside a model and then you can add items, either by dragging their symbol from the palette on the diagramming scheme or by creating them in the model tree if you don't know yet what is the symbol for the item you want to model. You can reuse the same architecture item in different views. More than one model can be open at once. You can also lock elements of the diagram to avoid unwanted changes. Elements can be grouped together in a view using a group container type. Archi offers also two types of diagrams that are outside the ArchiMate standard: the sketch and the canvas. These are generic diagrams that you can use to model some high level business contexts or processes. 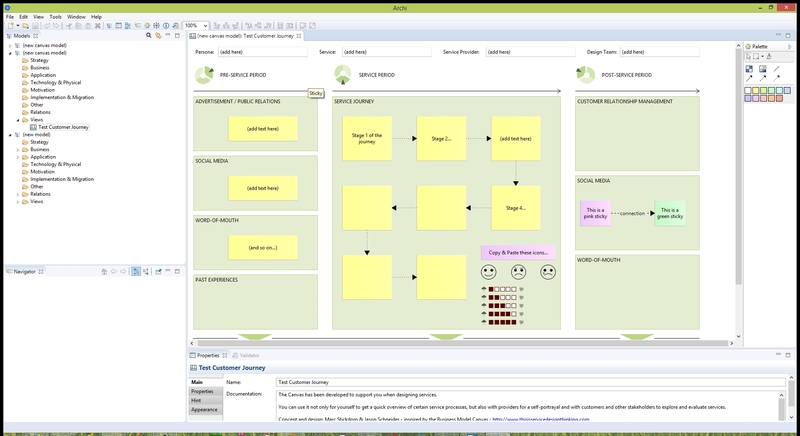 Some examples of canvas diagrams are supplied with the tool. View generation: You can generate a new diagram from selected ArchiMate items(s). Any ArchiMate item that is related to the selected elements is also added to the generated view together with any connections. Model validation: This feature provides advice and warnings on the integrity of an ArchiMate model. Double-clicking on an issue, or selecting the right-click menu item "Reveal Object" in the Validator window, will point to the affected object in either the models tree or a diagram. Import and export: It is possible to export the Archi model or its views using the CSV format in order to re-use the model in different applications. You can also export diagrams as images files. The adoption of Agile approaches has led in many cases to the abandon of classical architecture modeling and documentation. The concepts of "emergent software architecture" and "the code is the documentation" are a reaction against the big design up front (BDUF) waste. 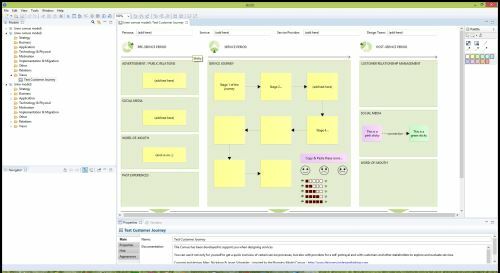 However, in large organizations there is still value in having tools that provides an overview visual model of the business processes and the various software and system architectures. The Archi tool provides an easy and cost effective way to model all or part of your enterprise business, IT and software architectures. I think that you will find value in this tool, even if you use only a subset of the ArchiMate model as a business analyst or a DevOps engineer.